After 5 years of travel I had determined that my purse needed replacing. I frequently shopped for a purse but couldn’t find the right one. While browsing facebook I realized that there was a direct selling company that sold purses and storage items. My newly renovated bathroom needed some new storage options. After seeing the products I joined the direct selling company, Thirty One Gifts and for one good reason. I was determined to abandon the dollar store solutions for customized storage options and a new purse. Living in an older home with limited living and storage space has been challenging. There are never enough shelves and there is always too much stuff. The bathroom area is especially difficult. I knew there was one thing I really needed: something to organize dozens of hotel soaps, knick knacks, and impulse beauty purchases that I had gained in the recent year. Here is the facebook post that really sold me for my new storage purchase. They also sell personalized monogram bags and storage solutions. I knew I could go to a big box retailer but I would not find anything personalized. The thought of trying to find someone with a machine to personalize the item was more effort than I could handle. 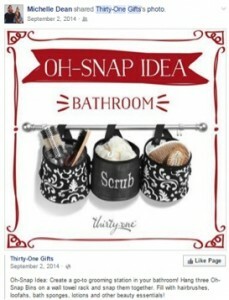 I knew that going directly to Thirty One Gifts I would get exactly what I was looking for. I saw their distributor kit had a $99USD price tag. I decided the value was there and went ahead and purchased. soon. I was very interested in the stitching along the edge and the quality of the grommets. The stitching looked sturdy and I could see that the bag was well made. The inside material is the same gold as the stripe on the outside. Overall it has a very classy look. After purchasing the distributor kit (which includes samples of the totes, grocery holders, etc.) I immediately collected the three matching black and white bags for my sister-in-law who assures me that the mesh pockets on the side make it an amazing diaper bag. After calculating the retail cost of each bag I saw the huge savings in the distributor kit. If you are considering becoming a distributor of Thirty-One gifts you should know that the average price of items at Thirty One Gifts is $25 – $60. I spent the afternoon at the local furniture and craft stores and saw that these are fair prices for the quality of these purses and storage items in addition to the customization option. Almost all items can be personalized with a letter, word, or short phrase. They also allow you to choose between several fonts and colors of thread. I love checking out their customer specials. Usually they offer an incentive if you are buying more than one item or if your total order is above a certain dollar amount, which is, again, a great savings. It is a good idea to plan your purchases or include a friend who would also like to purchase in order to get the best value when placing an order. 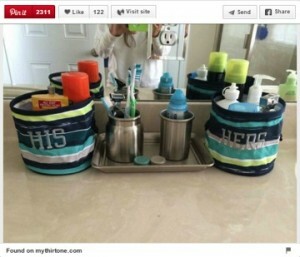 One thing I wish they had at Thirty One Gifts is the option of solid colors on every item. They seem to offer solid colors only on a few items. The primary problem with this is that some of the patterns make it difficult to read the embroidery. If you are standing close it is not an issue but it can be difficult to read from a distance, which, from an aesthetic viewpoint, is frustrating. other gifting opportunities. A simple personlized gift sends a nice message to the one you gift it to.